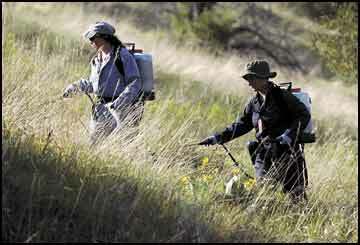 Kate Goodwin, left, and Marilyn Marler spray herbicide near the base of Mount Sentinel on Thursday. Eight years of herbicide application, weed-eating insects and weed pulling have helped bring back native plants and eliminate the weeds that used to infest the area, according to Marler, the University of Montana's natural areas weed manager. When it comes to the topic of invasive weeds, there's usually not a lot of good news to share about the stubborn plants putting down roots in western Montana. But here's some: The eight-year-long annual herbicide application on Mount Sentinel, along with help from rigorous weed-eating insects and human weed pullers, are doing a fabulous job in beating back the invaders, according to Marilyn Marler, University of Montana natural areas weed manager. On Thursday, Marler and her crew took to the mountain for their first spray of the season, and what they found was stunning. "It was awesome," Marler said. "We stayed pretty low on the mountain, where it used to be really bad and used to take several days and lot of time, and we found more native plants than weeds." With a crew of three people, fanning out across 10 acres, only about a half-acre was sprayed and the crew ended the day with half of their 40-gallon tanks of herbicide. In past years, the tanks would be drained within the first few hours of spraying. "It makes me feel really good that all our effort and our various methods are working," Marler said. "The amount of herbicide it is taking to do this is less and less. With fewer weeds to focus on, in particular leafy spurge and Dalmatian toadflax, it meant the crew had the unique pleasure of spending more time observing and enjoying Sentinel's native flowers that have returned home with showy enthusiasm. "It's really pretty up there right now," Marler said, "the balsam root, paintbrush, prairie smoke and the penstemons are all blooming." The other good news is that people have become educated about the weeds, especially knapweed, and have taken it upon themselves to pull the plants as they hike and walk the mountain, Marler said. Her advice: Keep pulling those weeds - it's helping out tremendously. Her other advice: Please don't pick the native flowers, but feel free to pick the Dalmatian toadflax, which will be blooming as early as next week. The blooms are yellow and look kind of like big snapdragon flowers. On the way down the "M" Trail at the end of their work, Marler came upon a bouquet of balsam root flowers someone had picked and then discarded. "It makes me so sad when I see that," Marler said. Every healthy, flourishing native plant, she said, helps keep the weeds away. Marler and crew will continue their spraying work on the face of Sentinel three to four times a week through the first week of July. "After today I'm optimistic," Marler said. "I think we're going to cover the mountain pretty well - we are planning to do about 20 acres on university property on the face of Sentinel." Anyone who wants to help with the effort is welcome to participate in a community weed pull on the mountain on Tuesday night. Volunteers should meet at 6:30 p.m. at the base of the "M" Trail. On Tuesday, the weed effort will focus on dyer's woad, a plant that has indigo in it, and is used to dye cloth and wool blue, Marler said. It's a new invasive species to Montana and Marler wants to chase it out before the plant makes Sentinel home. So if you are a guilt-prone weaver, spinner or natural dyer, get your hands busy Tuesday night - and pull your woad. Anyone who wants to help with the effort to eradicate weeds on Mount Sentinel can participate in a community weed pull on the mountain on Tuesday night. Volunteers should meet at 6:30 p.m. at the base of the "M" Trail.